Price compare feature allows you to pick items with the best price from your shopping lists. Unit price, Compare price or price per piece in package can be used for comparison. In addition to item name, Generic name can be used to match items for comparison. Add an item to your shopping list, e.g. Lipton Iced Tea pack of 12, unit price $6.45. Add another item to your shopping list, e.g. Nestea Iced Tea pack of 24. unit price $9.99. Set Pack units for these records. At this point items can’t be compared because they have different names. You need to make sure that items have the same name or set same value for Generic name fields. 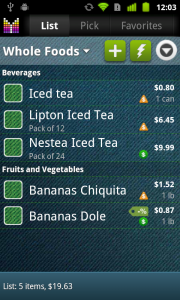 Open first item and long-tap the Name field –> select Generic name –> enter Iced tea. Repeat the same steps for the second item. Tap the Notification portion of the Price compare row. 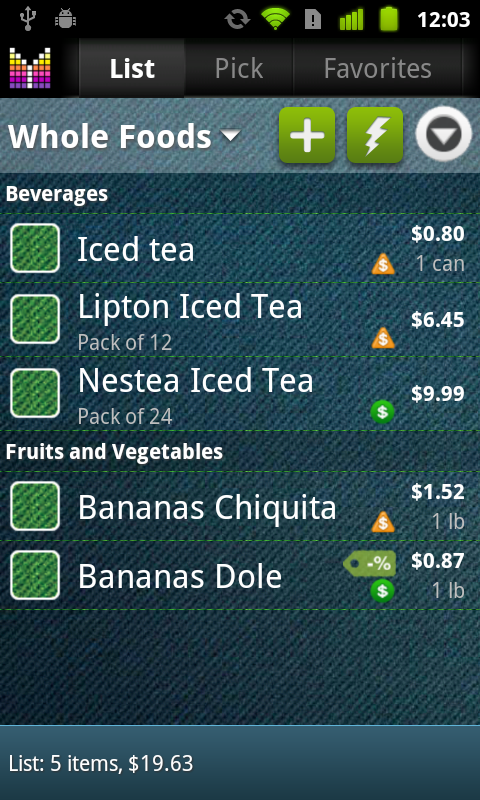 The price compare screen shows that first item has better price: $6.45 vs. $9.99. Open the first item, tap the Compare units field of the Price compare row. Choose Each. Enter 12 as Package size. Repeat the same steps for the second item, but enter 24 as Package size. Tap the Notification portion of the Price compare row. 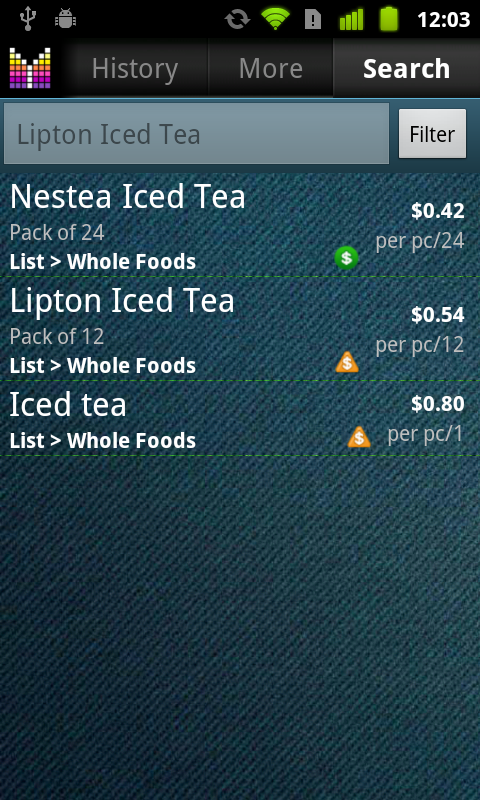 Now Price compare shows that the second item has better price per ea: $0.42 vs. $0.54. 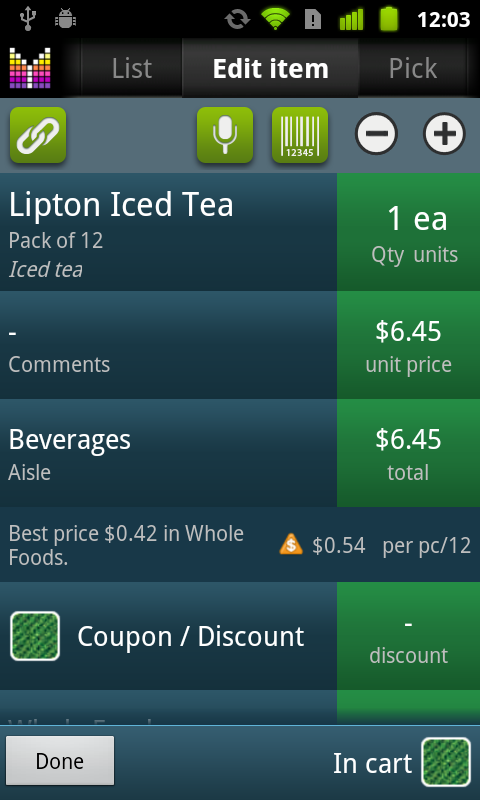 Finally, add a new item “Iced tea”, tap units field and make sure you selected Each, unit price $0.80. Notification section displays price comparison summary. Tap to open listing of other comparable items. Price indicator – green bubble indicates the best price, orange triangle indicates that some other item has better price. Compare price shows unit price or unit price per smaller unit which is used for price compare. Tap to set Package size. 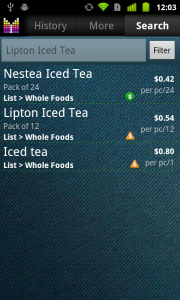 Compare units shows units used for price comparison between differently packaged items. Generic name — set generic name which is used for price compare. Same as long-tap on Name field –> Generic name. Delete other items — deletes other comparable items. This is handful when you decided which item you’d like to purchase and want to get rid of other items with worse prices. Price compare feature matches items by name. Sometimes you may want to compare similar items of different brans or sizes such as “Nestea pack of 24″ and “Nestea pack of 12″. This is when Generic name is useful. To change Generic name, long tap the Name field and choose Generic name. You can see comparable items by tapping Price Notification portion on the Price Compare Row or by tapping Link button (top-left of the screen) –> Compare prices. Items from shopping lists can be compared with items in other shopping lists only. Favorites can be compared with other Favorites. Does price compare refer to data stored in history or does it only use current price entries? I thought the shopping idea behind comparison was to determine the best place to purchase products and expected comparisons to reflect variation in prices over time and location. In fact, I thought it had done that in the past, though it does it no more. Can someone explain how price comparison gives a useful comparison ? Kindly note that Price Compare feature compares latest prices between shopping lists on your handset which helps to decide which store to purchase the item from. It is possible to see Price History (Long-tap an item > Price History), but this information is not used for Price Compare. Hopefully this helps. How do you update the price of an item so that a price history is stored? Deborah, just checkout after each shopping trip and item prices will be saved in History. How do u get rid of price comparison icon. Unfortunately, hiding price comparison icon is not possible at the moment. You may want to make slight changes in your item names so that the app won’t consider them comparable. Does mighty grocery have a calculator feature? Lynn, Mighty Grocery does not have built-in calculator, but you can launch a standard Calculator app when editing price or Quantity. How about a flag in my current store’s list if it is available at a different store’s list? And a special flag color if it is available for a different price? Ruthie, if an item is available in multiple lists, the price compare indicator should show which list has a better deal. Have you tried adding the same item with different prices in different lists? I’ve been using Mighty Grocery for about a couple of years, but only now decided to see how the price comparison function works. And I’m surprised! I ‘m wondering, who needs to compare two different tea packs by price? I’d rather compare the same product in different stores/shop malls. But I have not found how to split the product by shops other than just to enter two different product records with different comments. If there is already such functionality enabled, please, give me a link to a description. If not, I would say this is what I want primarily from the price comparison function. Denis, in order to add products into different stores, you need to add records into List-specific Favorite lists. Please let me know if you have any further questions.